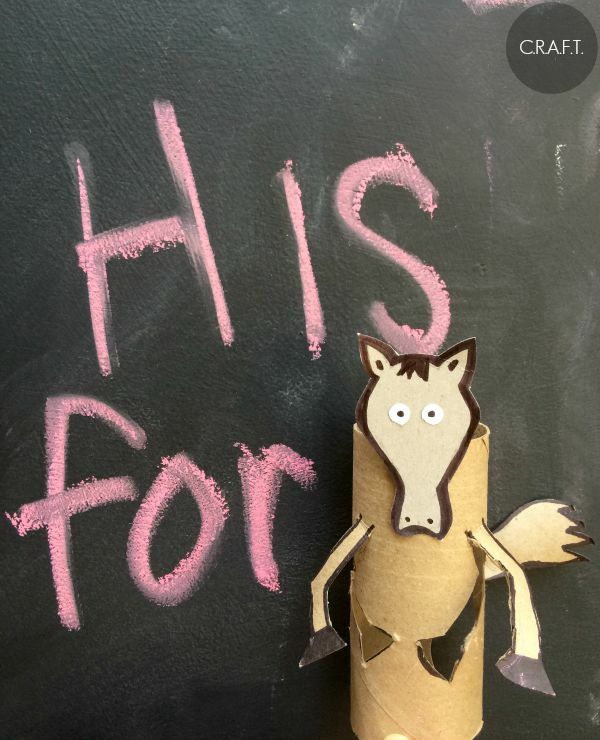 Horse: Toilet paper roll crafts - C.R.A.F.T. H is for horse, or course! Max is working on his horse noise, ha! His newest animal noise is a monkey, it’s pure greatness. He learns most of his animals from books. Andy started the tradition of making the animal noise when they would see the animal in the book. This has translated into an animal ispy game all day, every day. If Max spies a tiny cow on a yogurt container in the grocery store, you better believed there is moo-ing involved! I am very impressed with his observation skills, he spots way more animals than I ever noticed! For whatever reason, horses are not an animal that we see on an every day basis. Really he only sees them in this fun book: The Artist Who Painted a Blue Horse and now, in this fun horse craft! This toilet paper tube craft is very similar to first few (A is for anteater and B is for beaver). You will need an empty cereal box to craft the horse head, and then glue the head to the top of the toilet paper tube. And I’ve got lots of fun horse facts for y’all today! Horses can sleep both standing up and laying down. Horses have the biggest eyes of any other living mammal that lives on land. Y young male horse is called a colt and a young female horse is called a filly.